According to the reports in Spain, Real Madrid have decided to let their goalkeeper, Diego Lopez, leave the club, as they get ready to present his replacement, the Costa Rican international, Keylor Navas. The club legend, Iker Casillas, who was the club's cup goalie last season, is staying at the Bernabeu and will fight for the number one spot with the twenty seven year old Navas. Diego Lopez is rumored to be heading to Monaco, although Napoli and Chelsea FC are strong contenders to sign him as well. If Chelsea manage to unload of Petr Cech, they will come gunning for Lopez so he can compete with Thibaut Courtois. 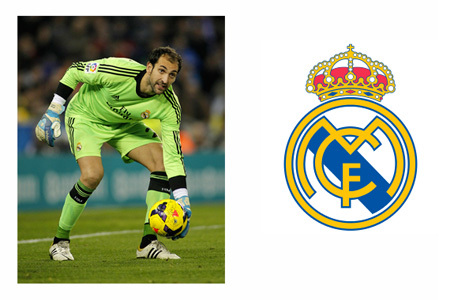 Diego Lopez came to Real Madrid two seasons ago as the back up for injured Iker Casillas. Even after Casillas recovered, Lopez stayed as the club's preferred keeper. The people at Real Madrid are thankful for Lopez's services and it is believed that they will pay out his contract in full and let him go wherever he wishes. Diego Lopez is 32 years old and would be a welcomed addition to just about any club on the planet.